Over 3,500 labourers, backed with heavy machinery, are working to prepare safe land in the Cox’s Bazar refugee camps. 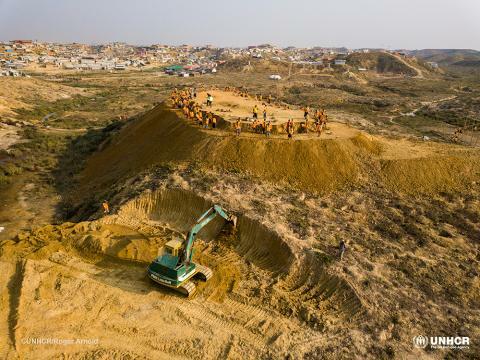 COX'S BAZAR, Bangladesh, May 8 2018 - Humanitarian agencies working in Bangladesh’s Rohingya refugee camps today marked the completion of the first new plot of land prepared to relocate families most at risk of landslides during the upcoming monsoon season. The work is part of a major joint initiative involving IOM, UNHCR and WFP. It has involved dozens of earthmoving machines and a workforce of over 3,500 labourers, including both Rohingya refugees and members of the host community, to prepare the land so that families can move to safer ground. The newly prepared 12-acre plot is now ready to receive shelters and other key services, including water, hygiene and education facilities. It will provide new homes for nearly 500 families currently living on steep, sandy hillsides in some of the most high-risk parts of the refugee site. “Seeing this first plot now ready for the next stage of relocation shows the practical and life-saving achievements that can be created from this kind of interagency collaboration to keep the refugees safe,” said Manuel Marques Pereira, IOM’s Emergency Coordinator in Cox’s Bazar. “With the monsoon season almost upon us, we will continue to work urgently to prepare more land, coordinate services, secure vital access and ensure we are ready to respond to emergency situations when they arise,” he added. Almost 700,000 refugees have fled violence in Myanmar since August 2017, bringing to around 900,000 the total number of Rohingya refugees in Cox’s Bazar district. The vast majority of the refugees are living under tarpaulins and bamboo shelters in desperately over-crowded conditions. Across all the settlements, around 200,000 people have been identified as being at high risk of floods and landslides when Bangladesh’s notorious cyclone season and heavy monsoons hit in the coming weeks. The immediate priority is to try to relocate around 24,000 people at highest risk from landslides. The Government of Bangladesh recently allocated around 500 acres for potential relocations. But due to the hilly topography, only a fraction of that area can be made safe and used before the monsoon, which will begin in earnest next month. The area was prone to landslides even before the refugees settled on the steep slopes, creating de-forestation and erosion. “It will be a race against time to get everything ready, so that the most vulnerable families at high risk of landslides and flooding can be moved to safety before the worst of the monsoon season gets underway,” he added. The joint Site Maintenance Engineering Project (SMEP) between the three agencies is a practical and innovative response to support the Government of Bangladesh in emergency preparedness and response. It was specifically designed to save lives, reduce landslide and flood risks, and maintain access to the refugee settlements. As well as preparing land for relocation, SMEP agencies are working to improve roads and drainage, and to build bridges that will ensure continued life-saving access when the worst weather hits. Crucial SMEP activities include the creation of ten operational centres across the Cox’s Bazar area where pre-positioned machinery will be available to clear vital access routes in the event of landslides and keep key waterways open to prevent blockages leading to floods. In addition to excavating machinery, tools and equipment, the centres will also stock prefabricated bamboo bridges and piped culverts to help reopen damaged access ways as quickly as possible. But agencies have also warned that SMEP and other critical services to help safeguard the refugees is under imminent threat due to a major funding shortfall. The Joint Response Appeal from all key agencies working on the Rohingya response in Cox Bazar has secured just 16 percent of the total USD 950 million needed for the response until the end of the year – leaving a current shortfall of $794 million. The heads of all three agencies in Cox’s Bazar have underscored the urgent need for more funding to allow critical life saving work to go ahead before the monsoon hits.